eLearning can be lonely, especially self-paced eLearning courses that don’t rely on human interaction. Thankfully, there are ways to capture the magic of social learning and peer-based feedback in your next eLearning course. In this article, I’ll highlight 5 online group collaboration ideas that are creative, effective, and 100% engaging. 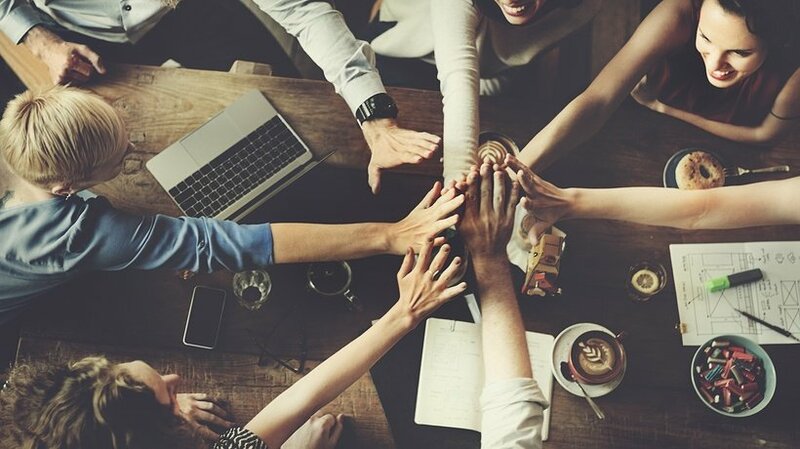 Online group collaboration gives online learners the power to interact with their peers and benefit from each other’s experiences, skills, and talents. They get to see things from a whole new perspective and overcome common challenges together. In short, online learners put their heads together to expand their knowledge base. With the right online tools and a few innovative ideas, you can transform your next eLearning course into an interactive online group experience. One of the primary goals of online group collaboration is to get your online learners interacting with each other. This is their opportunity to brainstorm new ideas, test their assumptions, and learn from different viewpoints. And nothing breaks the ice and gets the conversation flowing like a good mystery. Humans enjoy riddles and brainteasers that let the imagination wander. Create an eLearning video, case study, or interactive online presentation, but leave out the ending. Give them all the clues they need to solve the problem collaboratively. For example, point them to online resources that may be useful. This real-world mystery doesn’t necessarily have to be taken from the news headlines or history books. In fact, you can create your own sleuth story that puts online learners in the role of detective. Create a list of topics for online learners to choose from and then ask them to design an eLearning blog based on the key takeaways. There are a variety of free blogging online platforms they can use to get started, many of which feature themed blog templates. Exploring the topic at length with their peers gives them the ability to build new soft skills and improve their comprehension. Instead of just reading about the concepts, they must dive into them headfirst in order to create succinct blog posts. A subject matter blog can also help the group monitor their progress and stay in contact. They can periodically add new links to online resources or other posts as their knowledge evolves. Last, but not least, these thematic eLearning blogs are valuable sources of information for the future online learners. You can create a list of learner-generated blog sites and upload it to your eLearning course library. Divide your audience into groups and then break each into two separate teams. Assign a topic and ask them to pick a side. Make sure it's nothing too controversial, as you don't want to cause an all-out eLearning war. Both online groups have the opportunity to discuss the topic amongst themselves, before debating their stance with the opposing team. This can all be done on the eLearning forum. Or you can use a video conferencing tool to make it more interactive and immersive. After the online debate, encourage online learners to meet with their team again to recap the discussion points and provide personalized feedback. Quick Tip: The online discussion can spiral out of control if you don't set some basic ground rules in advance. Develop guidelines that every member of the group must follow. Include conflict resolution recommendations, participation expectations, and a list of suitable topics. This will help your online learners stay on topic and prevent any confusion later on. Better still, create a subject schedule that outlines all of the topics you'll cover, when, and some valid points for the online discussion. If the conversation veers off course, steer it back by posing a thought-provoking question or giving the online group a reflective prompt. This is a win-win for all parties involved. Online groups have the opportunity to develop microlearning online resources. In the process, they get to explore the topic in depth, hone their skills, and learn from their peers. Once they upload the microlearning content, all of their peers can use it during their "moment of need." Finally, online instructors have the opportunity to assess online learner progress and identify areas for improvement. As a general rule, microlearning content should focus on a specific topic or task and be easily digestible. For example, a 5-minute task tutorial or online video demo. You can also compile a microlearning online library that features links to all of their eLearning content. Use a video conferencing tool to hold a live eLearning event. eLearning webinars offer online learners the ability to interact with their peers via the comments section, as well as their online instructors or facilitators. You can make it even more interactive by pairing it with eLearning activities and other online resources. For example, encourage online learners to watch an online tutorial or participate in a branching scenario during the intermission. Discuss the eLearning activity after the fact and reiterate the ideas to improve knowledge retention. Be sure to schedule the webinar in advance so that online learners can rearrange their schedules if necessary. Also, give them a list of topics you'll discuss a week or two beforehand. This gives them the chance to reflect on the concepts and formulate their questions. Quick tip: Don't forget to record your eLearning webinar so that absent online learners can still enjoy the eLearning experience. They may not be able to ask questions live or respond to comments, which is why you should develop a companion blog or social media group. This provides them with an eLearning forum to address their concerns and clarify issues while they are watching the recorded eLearning event. Online group collaboration projects also help online learners build essential life skills. Improved communication, problem-solving, conflict resolution, and Project Management are just some of the rewards up for grabs. You can use these online group collaboration ideas to give your online learners these all-important perks. Apart from meaningful online group collaborations ideas, you also need to serve as an eLearning moderator for your online learning communities. Read the article 8 Ways To Facilitate Meaningful Online Discussions In eLearning to learn some additional tips to spark meaningful online discussions.